Pictured left to right: Stephanie Merryman and Yolanda Alexander. Dallas, TX (RestaurantNews.com) Dallas-based Cowboy Chicken recently presented a check for nearly $13K to Feeding America and Houston Food Bank, organizations working together to deliver food, water and other essentials to communities devastated by Hurricane Harvey. The donation directly benefits local families impacted by the hurricane. 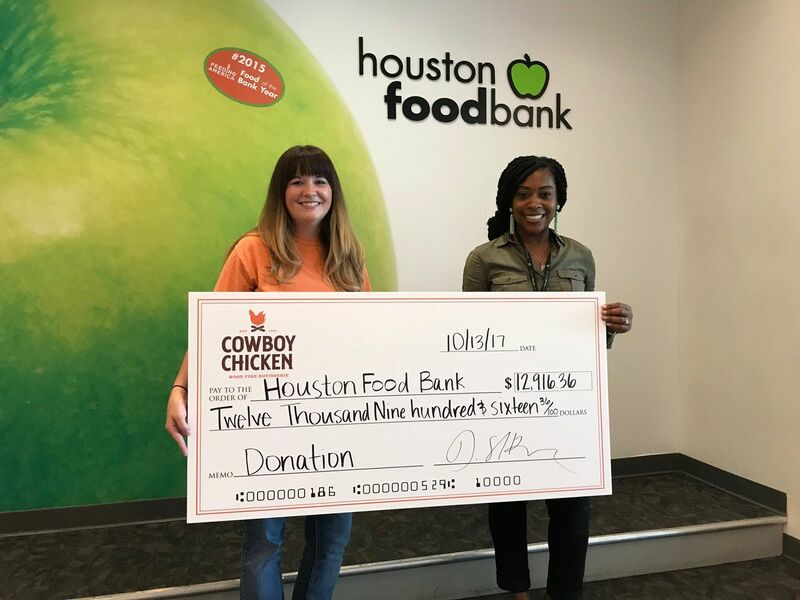 Merryman recently spent time volunteering at Houston Food Bank where she presented the check to community engagement manager Yolanda Alexander. Founded in Dallas in 1981, Cowboy Chicken is a fast casual restaurant chain specializing in real wood-fired rotisserie chicken. The brand has been included in Fast Casual’s Top 100 Movers & Shakers list every year since 2012 and in 2017 won the Emerging Chain of the Year award from Restaurant Business and was named one of the Top 25 Most Loved Brands by Foodable. Forbes magazine also chose Cowboy Chicken as one “Hot Restaurant Chain to Buy into Now.” Cowboy Chicken is currently seeking qualified franchisees to help build the brand in select markets across the U.S. For more information, visit www.cowboychicken.com or contact Kathy Davidson at kdavidson@cowboychicken.com. © 2019 RestaurantNews.com. All rights reserved.